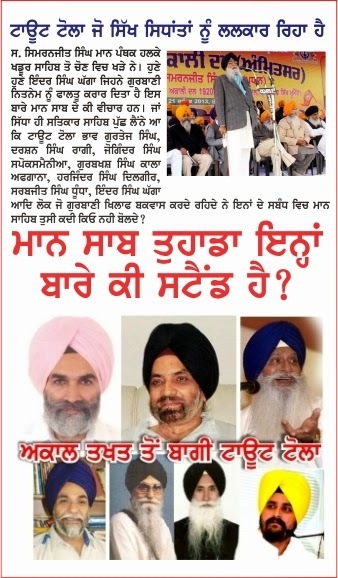 Home » Khalistan , tout » WILL SS MANN CLEAR HIS STAND ON TOUT TOLA? WILL SS MANN CLEAR HIS STAND ON TOUT TOLA? Sardar Simranjit Singh Mann is a Lok Sabha candidate for the Sikh constituency of Khadur Sahib. If Mr. SS Mann is a sincere Sikh leader we would wish that he clarifies his stand on the Govt of India's secret touts who were recruited to counter the movement for Khalistan. Popularly called Tout Tola (tola means gang) they are now attacking Sikh tenets. Recently a member of the tola Inder Singh Ghagga wrote an article in the tout paper Spokesman challenging the very concept of prayers or remembering God. We feel it is high time that Sardar SS Mann who claims himself to be the successor of Sant Jarnail Singh Bhinderanwale clarify his stand on the activities of Tout Tola. Does he approves them or condemns them. All these years Mann has maintained his silence on this. We request him to make the stand clear before we take the issue to the masses. Will Mann sahib approve what they are saying on the Bani of Dasam Patshah Sri Guru Gobind Singh ji.